Be the first to share your favorite memory, photo or story of Eura. This memorial page is dedicated for family, friends and future generations to celebrate the life of their loved one. 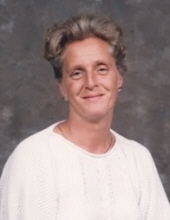 Eura Mae Elkins, age 75 of Powell's Creek, passed away Sunday, March 24, 2019 at her home. She was a homemaker, a hair dresser and former shop owner and an Avon representative for years. She was of the Baptist faith. Eura Mae was born in Pikeville, Kentucky on December 22, 1943 the daughter of the late Willard and Elizabeth James McCurry. Along with her parents, she was preceded in death by her husband, Garland Elkins and one brother, James Delbert McCurry. She is survived by one son, Randall Lee Tackett of Powell's Creek, a step-son, Tommy Elkins of Macon, Ohio, one daughter, Tammy Lynn Bowyer of Nashville, Tenn. and an adopted daughter, Courtney Elizabeth Elkins of Nashville, Tenn.
She is also survived by her sister-in-law, Alda McCurry of Powell's Creek and one grandchild, Stephanie Lynn Bowyer. To send flowers or a remembrance gift to the family of Eura Mae Elkins, please visit our Tribute Store. "Email Address" would like to share the life celebration of Eura Mae Elkins. Click on the "link" to go to share a favorite memory or leave a condolence message for the family.